Also, did you know there are more than four kinds of puto? (SPOT.ph) What’s a Filipino table without rice cakes? Those bite-sized, stick-to-your-teeth, colorful snacks otherwise called kakanin? History books and cooking guides tell us that "kakanin" comes from the root word "kanin," which literally translates to rice. Because of the plethora of rice, these sweet, mini treats can be found in almost every country in Asia. You might be familiar with Japan’s mochi, or Korea’s famous street food tteokbokki (that has appeared in practically every K-drama known). Well, we have to hand it to our ancestors who’ve come up with not only one, but dozens of unique kakanin recipes that span across provinces. In spite of that, these heirloom snacks are often linked to traditional and back-breaking procedures and preparations—a reason why most rice cakes are only cooked during special occasions like big family reunions and fiestas. Some, on the other hand, would argue that this classic merienda is already a “vanishing tradition,” a sad reality brought about by urbanization and fast-paced living, as well as the stream of global cuisine arriving in the country. Here, we give you a guide to the most popular Philippine rice cakes that many childhood memories are made of—one that hopefully wouldn’t be reduced to a page in a history book. Filipinos and bibingka have quite a lot of history together—so long that it's been around since pre-colonial times. A common treat during Christmas season in the Philippines, bibingka can either be synonymous to simbang gabi or cozy December breakfasts. This round, spongy, flat cake with crisp edges is traditionally cooked with a bibingkahan (where the rice cake’s name is derived). The bibingkahan is a contraption that uses scorching-hot coals above and below a banana leaf-lined clay pot (or pan) to cook the dish. The centuries-old method is crucial if you want to get that characteristic smoky flavor and charred aroma. 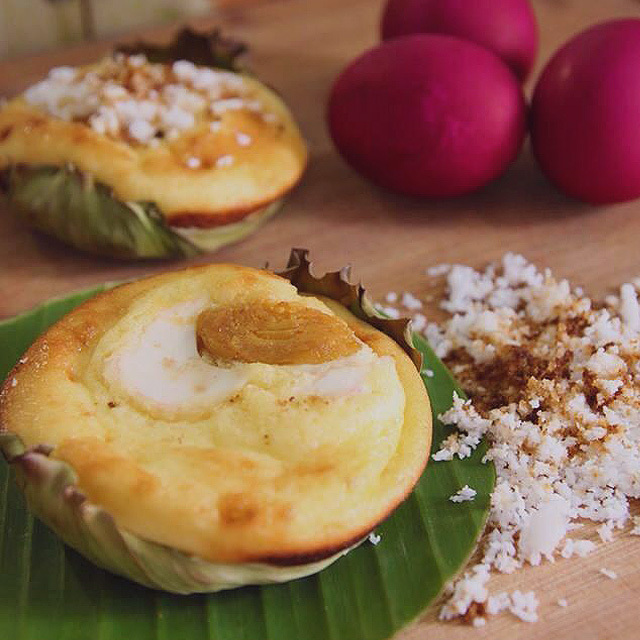 Best served fresh and warm, the bibingka galapong is the most common type of bibingka. It’s made of regular rice flour and coconut milk or water. Nueva Ecija is popular for their bibingkang malagkit, a stickier and denser version, which uses glutinous rice flour. Other variations of this mini rice cake are the bibingkang cassava (made from fresh cassava or cassava flour) and bibingkang mandaue, a bibingka that originated from Mandaue, Cebu. The latter has a tangier and less sweet taste than the bibingka galapong and it typically uses tuba or palm wine along with rice flour and coconut milk. When tuba isn’t available, locals use yeast instead. With its milky and subtle base, bibingka can be garnished with various, flavor-packed toppings like salted egg, butter, cheese, dried or roasted coconut shreds, brown sugar, and even pinipig (crunchy toasted rice grains). Many home cooks and bakers would argue that making puto is a more delicate procedure than baking a cake. To create a perfect steamed-rice cake, a number of factors such as room temperature and cooking conditions should be taken into consideration—too hot, and the puto may end up tasting sour; too cold, and the mixture might not rise. Of the many native rice cakes in the Philippines, puto probably has the most variety. The most common version of puto is the mini, cupcake-like ones topped with cheddar cheese or a slice of salted egg. This local snack pairs beautifully (and quite surprisingly) with savory Filipino dishes like dinuguan or pancit. 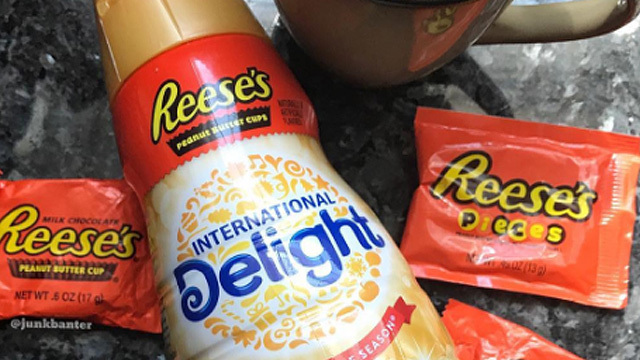 Some people prefer to have it with melted butter for added flavor and indulgence. Also good on its own, the puto manapla of Negros Island and Iloilo is typically eaten with batchoy by locals to create a striking yet balanced contrast between the richness of the noodle soup’s broth and the sweetness of the rice cake. Additionally, the puto bumbong is another Christmas-season staple made from a violet-colored pirurutong rice mixture that’s poured into thin bamboo tubes then steamed. Laguna has its own type called the puto biñan, a unique delicacy that uses grated cheddar and salted egg or kesong puti and served in a bilao or rice winnower. 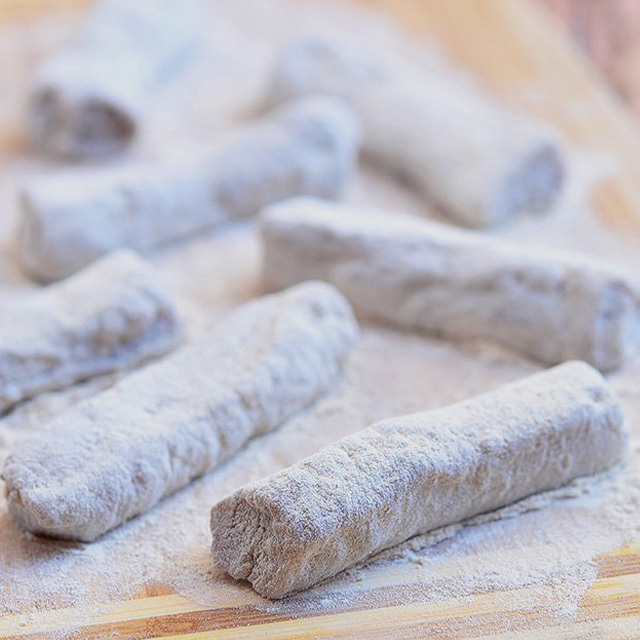 Although it has the same ingredients as puto, the puto seko looks more like a powdery cookie than a steamed-rice cake. 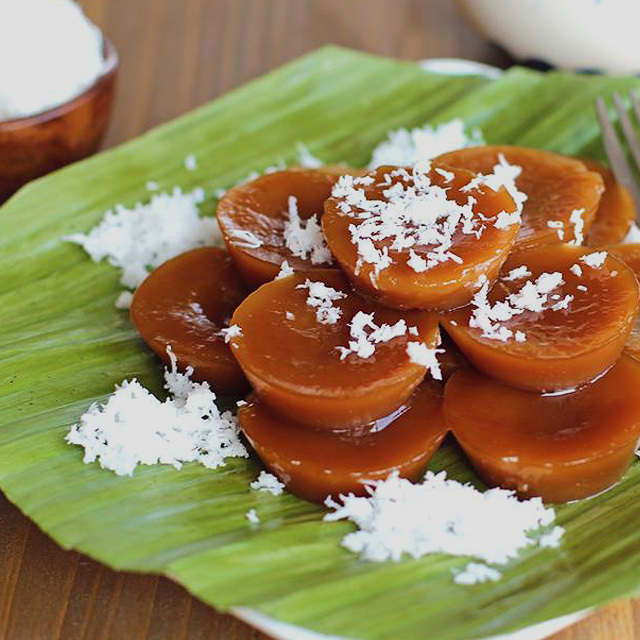 Lastly, the puto maya is a Cebuano and Davaoeño favorite that’s usually eaten with fresh mangoes and hot tsokolate eh. It uses sticky rice, coconut milk, and sometimes, ginger. 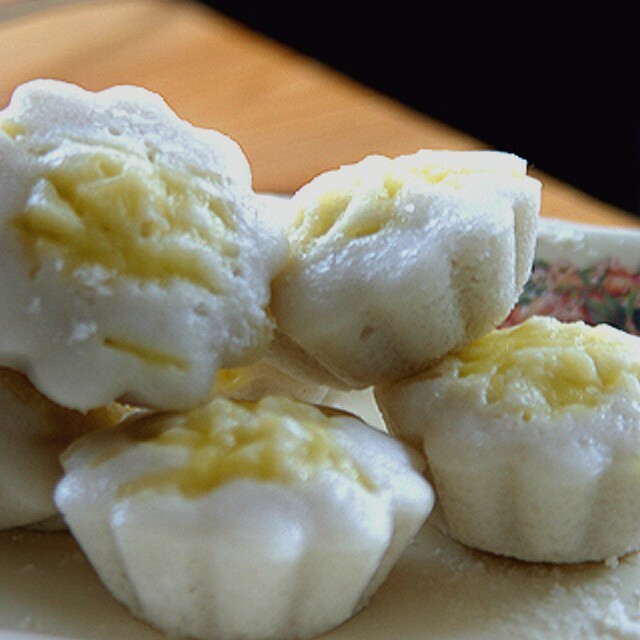 This local delicacy is a sweet rice cake made of whole glutinous rice and coconut milk. But the key ingredient of this sticky confection is brown sugar, which is boiled with the rest of the ingredients until the mixture forms a thick, caramelized consistency. Once the concoction is heavy, it is transferred to a round platter to cool down. 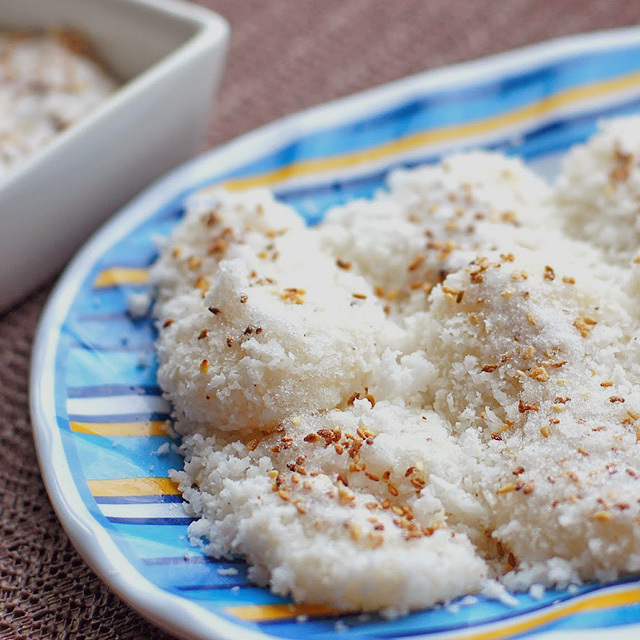 Latik is arguably one of the best things about eating biko—otherwise known as dry coconut curds, these are sprinkled on top to give the rice cake a nice, nutty flavor. Biko has become a staple afternoon snack all over the Philippines and can usually be bought at your nearest public market and carinderia (that is if you don’t plan to make this easy recipe at home). 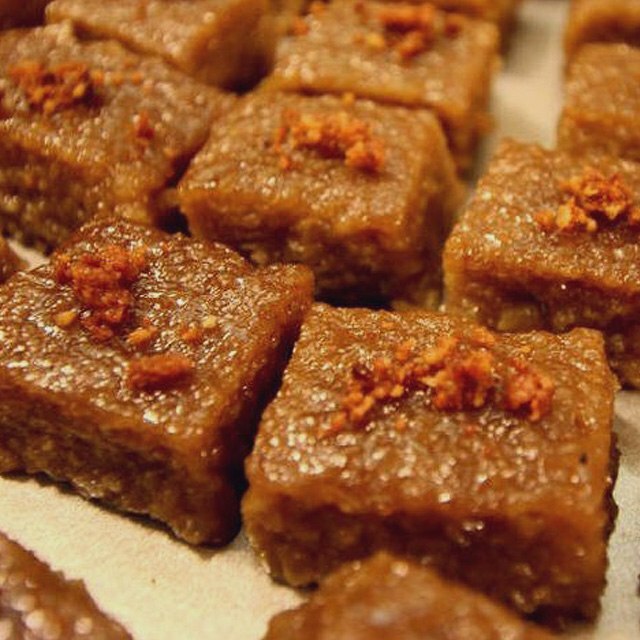 Some versions of biko are topped with a sweet and gluey, dark brown spread called kalamay, which is another type of rice snack made of ground glutinous rice, brown sugar, and coconut milk. If kalamay seems familiar, it’s actually a popular pasalubong from Baguio called sundot kulangot. Other regions also have their own versions of kalamay. Take, for example, Bohol in Central Visayas, where they serve their kalamay inside halved coconut shells, so people can scoop out the gooey treat with a spoon. In Iloilo, the kalamay is much thicker in consistency while the Mindoro equivalent uses grated coconut and is laced with creamy peanut butter. This chewy, filling snack will remind you of Japanese mochi because of its gummy texture and dusting of toasted-flour powder. Also known as baye-baye, espasol is a cylindrical sweet rice cake that originated from Laguna and is made of glutinous rice flour, coconut milk, sugar, and sometimes shredded buko or young coconut. If you ask Laguna locals, they’ll say that some of the best-tasting ones can be found for cheap in Alaminos, Nagcarlan, Pagsanjan, and Los Baños. These white-colored treats are also ubiquitous in bus stops and pasalubong centers all over the province. In Peñarada, Nueva Ecija, however, some home cooks give their espasol a different twist by adding carabao’s milk, condensed milk, and butter to the mixture. Roving kakanin vendors are still a run-of-the-mill sight in provinces and some neighborhoods in Metro Manila. These manlalakos carry an assortment of local rice cakes including kutsinta (also called puto kutsinta), a soft, almost opaque and reddish-brown snack that has a mild caramel flavor. The delicacy is almost jelly-like so anyone, including kids, can munch on it effortlessly (minus the feeling of your jaw falling off when eating extremely sticky food). People usually enjoy kutsinta on its own or garnished with crunchy grated coconut. The palitaw gets its name from the Filipino word “litaw,” which means “to appear.” It’s one of the more interesting and entertaining rice snacks to watch while cooking—here, you’ll see little flat discs of snow-colored dough springing up from the bottom of a pot filled with boiling water. Initially made of just rice flour and water, the dough is ready to be scooped out and eaten once it has risen. Like the espasol, the chewiness of palitaw will make you think of Japanese mochi minus the sweetness and powdered coating. It’s then dipped in grated coconut, sugar, and sesame seeds before serving, which makes for a chewy and nutty light snack. Bruising the sesame seeds slightly by pounding them with a mortar and pestle is one trick some cooks do to maximize its earthy flavor. A byproduct of palitaw is masi, which can be found in the Visayas region, particularly Cebu. Although quite unpopular in Luzon, this version, which is basically palitaw stuffed with sweet and gooey peanut butter, is just as delicious (if not better than the classic). 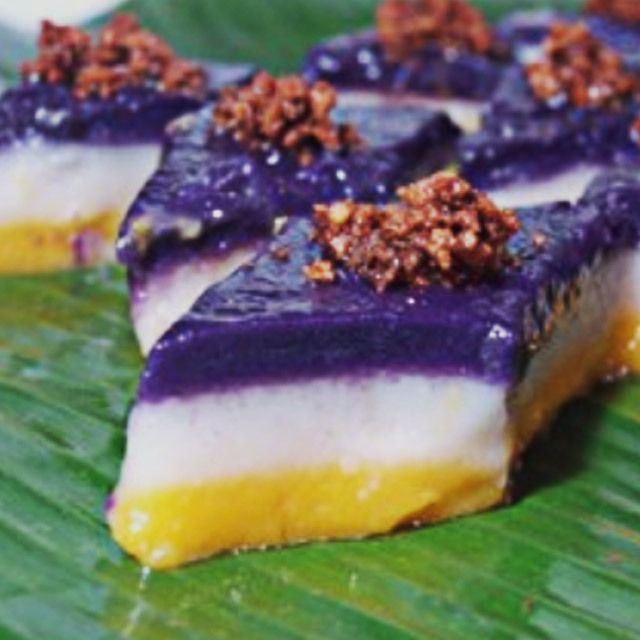 Among all the native sticky rice delicacies of the Philippines, sapin-sapin is probably the most vibrant. This steamed concoction is a fiesta in itself: Multi-colored layers of a sticky rice mixture are stacked on top of each other, with colors ranging from yellow and violet to red and orange. 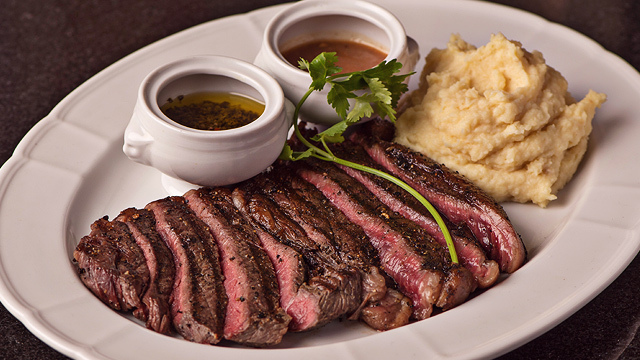 It's not just a feast for the eyes, but also for the palate. Here, you get an explosion of sweetness from the medley of sugar, coconut milk, purple yam, puréed corn, and latik. The subtle glutinous-rice base acts as a blank canvas holding everything together. If you're planning to try some, we suggest you go to a place where they make sapin-sapin from scratch, as commercial versions tend to use only artificial coloring and flavoring. 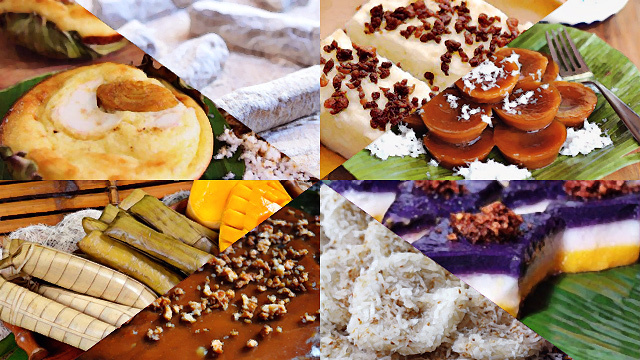 Perhaps the most widespread and versatile of Filipino rice cakes is suman, which can be found throughout the country—from Pangasinan in Luzon, down to Leyte in Visayas, and Lanao del Norte and Lanao del Sur in Mindanao. Although they vary per region, their base elements remain the same (and are as simple as it gets): glutinous rice and coconut milk. Frequently wrapped in banana or palm leaf, this thin, savory delicacy can also be eaten many ways including dipping it in sugar or pairing it with ripe mango to balance the fruit’s zest. There is no right manner to scarf down this simple treat—and that’s the beauty of it. The Maranaos of Lanao del Norte and Lanao del Sur have their own version of suman called dodol, which has a dark-toffee tinge compared to the creamy white suman many Filipinos are familiar with. While the dodol is a common sight in any Muslim table during Iftar and grand celebrations, it can be bought all-year-round in the provinces. Durian is sometimes added to its mixture to give it a unique and extra milky taste. The moron of Leyte and Eastern Samar, on the other hand, fuses Western elements like chocolate and margarine with the classic Filipino sticky-rice snack. The name may look politically incorrect, but its correct pronunciation is “mo-RON,” with stress on the second syllable. Otherwise known as bakintol in Waray, the moron has a distinct look, with streaks of dark brown (from the chocolate) staining its faint yellow color. In Tanauan, Batangas, there's the sumang magkayakap, where two sumans are tied together to make them look like they're locked in an embrace. It's so popular that the locals even hold a yearly festival for it. 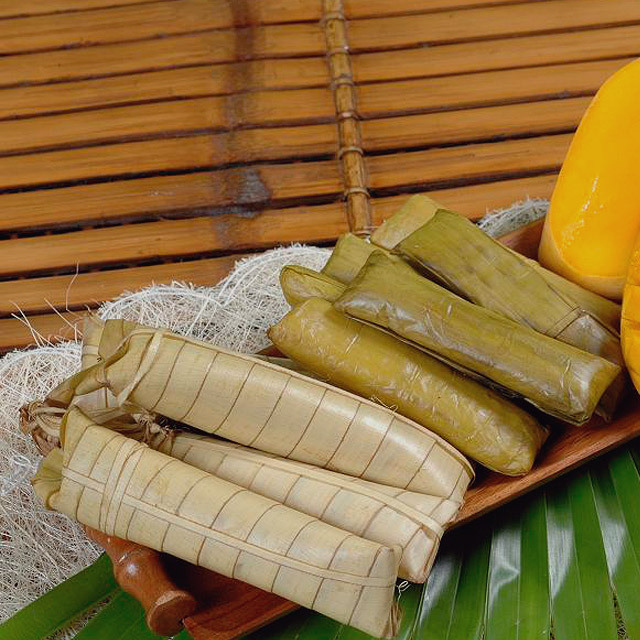 But the most ubiquitous in Luzon is Pangasinan’s suman sa ibus (or ibus), made of sticky rice, coconut milk, and salt, and wrapped in woven palm leaves or buri. The wrapper gets its bright-yellow color from turmeric, which is mixed with the water used for steaming this sweet rice cake. Eat it on its own or with sugar—either way, ibus remains a favorite of many through the years. References: “The Little Kakanin Book” by Gene Gonzalez; “Savor the Word: Ten Years of the Doreen Gamboa Fernandez Food Writing Award” by Anvil Publishing, Inc.; “A Culinary Life” by Nora V. Daza; “Reclaiming the Vanishing Tradition of Filipino Merienda” by Cecile Lopez Lilles (Published in The Philippine Star, September 7, 2006); “Bibingkang Mandaue” by Market Manila; “In Praise of Suman Past” by Elmer Nochesada.